Worried about cookware scratching or cracking your glass top stove? We feel you! Having to repair your glass cooktop can be extremely expensive. Our top pick is the KitchenAid Professioanl cookware set. Having the best pots and pans for a glass top stove may help save you money by avoiding unnecessary damages. In this guide we will review the best cookware for glass top stoves and identify what makes good cookware for glass or smooth top stoves. Duralon ceramic cookware offers great flexibility to cooks with any form of stove top. For example, if your RV offers an induction cooktop but your range at home has a glass top, this line of cookware will work well in either space. The Nuwave Ceramic 10-piece set offers three sauce pans and two stock pots. The sauce pans all have fairly long handles that will keep cool no matter how crowded your cooktop is. Ceramic non-stick finishes are extremely durable. The vented lids will reduce the risk of scorching, boiling over and other dangerous messes. Ceramic cookware cleans up easily by hand. Cooking with ceramic takes less oil. This can take some getting used to, so be prepared to experiment. These pans may not tolerate the dishwasher, but clean up quickly by hand. The word "bronze" in the description can be confusing. It refers to the finish, not the metal content. The stock pot handles are riveted in place and are curved far from the body of the pot, giving you space to grip and move them easily. Each piece has its own vented glass lid with metal edging for stability. The tempered glass will move easily from cooktop to oven, and these pots are rated to 350 degrees Fahrenheit / 177 degrees Celsius. The non-stick ceramic surface is finished in a bronze tone. This cookware contains no Teflon and will not subject you or your pets to harmful outgassing once they are hot. The Symmetry set includes two frying pans, three sauce pans (one with pouring spout) a stock pot and a covered sauté pan. It's constructed of hard anodized aluminum with stainless steel cladding so it will work on all cook tops, from gas to induction. The lids are tempered glass with metal edging for stability, and all handles are stainless with a silicon coating for a cool, comfortable grip. The Symmetry line is extremely heat tolerant from cooktop to oven. This cookware is quite lightweight and easy to transfer. The textured bottoms reduce sticking and make the pans very easy to clean. There are no vents in the glass lids. If washed in the dishwasher, these pans develop a film which dulls the finish. The circular grooves on the bottom of the pan can be vulnerable to chipping and damage to the non-stick surface. Unlike many non-stick product lines which will only tolerate 350 degrees Fahrenheit / 177 degrees Celsius, all of this cookware, including the lids, can tolerate 400 degrees Fahrenheit / 204 degrees Celsius. If you're trying to brown the top of a casserole or "finish" a pot of soup in the oven, the extra heat tolerance will help. These pans are textured on the bottom. If you've never used a textured non-stick, this can be a little off-putting and may seem to use more oil than expected. While you experiment with this feature, consider using an oil-spraying tool or oiling your food before adding it to the hot pan instead of heating the oil in the pan. This is a nice way to get a sear on salmon steaks and tuna steaks. Fans of KitchenAid tools and utensils will not be surprised at the simplicity, durability and quality of this set. They're coated with Whitford Eclipse, an extremely durable version of non-stick that offers terrific heat resistance. These pans can tolerate up to 500 degrees Fahrenheit / 260 degrees Celsius and will move easily from cooktop to oven. The edges of the lidded pots offer a ridge to increase the security of the lids so they seat well. The durable black finish inside and out will look great for years and require no polishing if you hang your pots. These pots are dishwasher safe and will not develop a cloudy finish. The lids are not vented. There's a rubber seal on the lid that may collect water in the dishwasher and it's hard to get this water out. This cookware is heavier than most non-stick; if you have physical limitations, this set may not work for you. The KCH2S10KM set includes two frying pans, two sauce pans, a stock pot and a sauté pan, as well as tempered glass lids for all but the frying pans. See our full KCH2S10KM review for an in-depth look at this cookware. 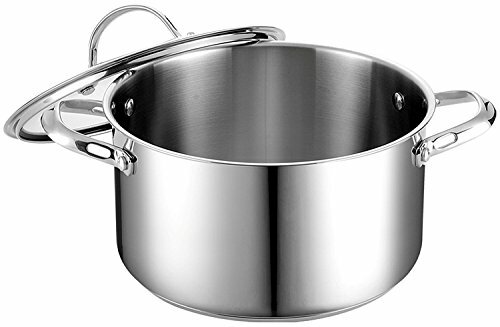 The handles are stainless steel and all handles for both pans and lids are affixed with stout rivets for long-term stability. The stainless steel in the cladding makes these pots suitable for all cooktops, including induction. The KitchenAid handle design is flared and squared off giving cooks plenty of space between hot pots and lids for safe gripping. 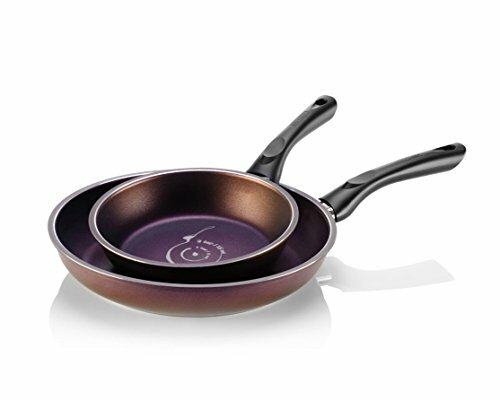 The Art Pan frying pan set does not claim to be induction capable, though the Blooming Flower Frying Pan from TeChef is rated as induction ready. Non-stick pans are generally constructed of anodized aluminum. Aluminum offers excellent heat transference, and anodizing it hardens and stabilizes the material, preventing warping. TeChef aluminum cookware is forged but does not claim to be anodized, and you may find that these pans will warp over time. Because induction cookware must have flat, continuous contact for the magnetic heating to occur, warped pans are especially problematic. The Art Pan Collection may be ideal for smooth top electric stove, but they do not claim to be induction compatible. Therefore these may not be the best pans for glass top stoves​ that are induction only. However, a better option in that case is the Blooming Flower pan. Our top pick is the Cooks Standard stainless cookware set that works on any type of cooktop, including induction. Its competes with compares with some of the best nonstick cookware without breaking the bank. 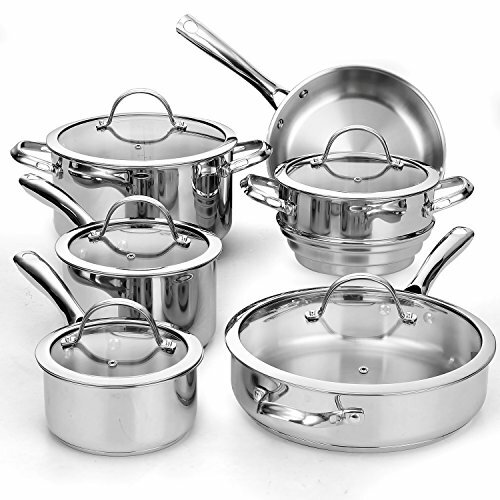 This set is constructed from sturdy 18/10 stainless steel, meaning that it will last for years (with proper care). Our Stainless Steel Cookware guide has more information on why it's so important. 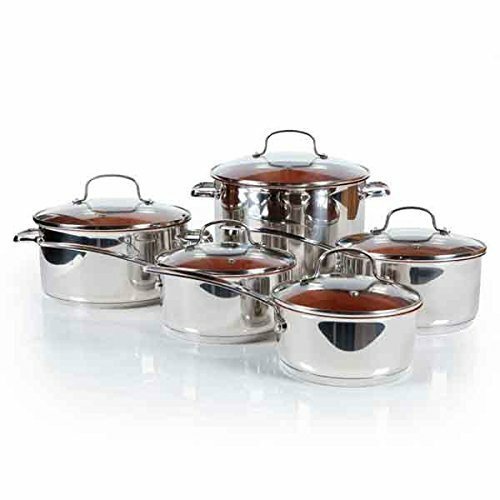 Unlike several other cookware sets, the 11 pc set offered by Cooks comes with a steamer insert. While you get one less pot, it might be better to have a steamer than another size of pot that you won't use. 18/10 stainless steel is beautiful and durable, but it's not nonstick. This means you'll have to use oil, preheat your pans fully, and avoid excessive heat when cooking with this set. If you'd prefer to just slap a skillet down and crack some eggs into it immediately, you might want to choose a set with a non-stick coating instead. Overall, the the Cooks Standard Induction Cookware set looks great and if you don’t have a large budget, this may be a good option for you and your glass cooktop. The glass on your cooktop isn't invincible. If you use a cast iron pan with a nasty rough spot on the bottom, you can scratch or even break your cooktop. Additionally, some materials (like porcelain) can melt at very high temperatures and fuse with the glass on your stove. Quickly run your hand over the bottom of any pot or pan that you plan to use. Check for burrs and defects which could damage your cooktop and don’t use them. There are two types of smooth topped ranges: induction and radiant. Induction ranges work by using magnetic magic to jiggle metal bits in your cookware and make them get hot. Radiant ranges radiate heat through the glass. They're functionally very similar to a traditional electric range with a bare heating coil, but they're much more attractive and easier to clean. Because they work by getting hot and then physically transferring the heat to your dishes, you don't have to worry about buying special cookware or anything like that. Electric ranges aren't the fastest when it comes to heat transfer, induction and gas cooktops are much quicker. Because of this, it pays double to make sure you understand how your cookware works when it comes to transferring heat. Ensure that any pot or pan you use has a flat bottom. This helps because more of the dish will be in contact with the heating element (there's a layer of glass in the way, but you can still think of it as direct contact). Heat travels very inefficiently through the air, meaning that this direct contact is essential for proper heat transfer. Aluminum and copper are both excellent conductors of heat. They heat up very quickly and when you turn the heat down they'll cool off fairly quickly too. Stainless steel isn't a particularly good conductor on its own, but it's usually used as a coating for another metal (usually aluminum). Cast iron is a fairly poor conductor of heat. It heats up very slowly, but once it's hot the heat stays in the metal for a long time. This is sometimes useful for searing, but most people use this for slower cooking. Unlike an induction range, you're free to use glass, ceramic and porcelain dishes on your radiant stove. Dishes made entirely out of these materials are usually poor conductors of heat, so be especially careful of the temperatures you're using. You don't want to accidentally set the burner so high you melt your dish and damage your cooktop. The most important things to remember when looking for the best cookware for glass cooktops is that the bottom should be flat, smooth, and free of rough spots. 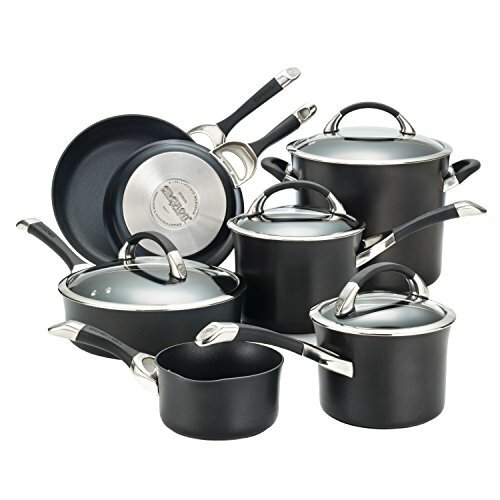 While we presented only a few cookware options to you, there are hundreds of others that are available on the market. If we had to pick one from our examples, we would choose the KitchenAid professional because it can be moved from stove top to oven and is induction capable. I find that skillets slide around on my glass stove top (Whirlpool). If we accidentally bump the handle it can almost move off the stove. What can be done about this as we do not have the possibility for gas in our house. This is very common problem with these types of cooktops. It could be that your cookware is warped a little and not allowing full contact with the cooktop which makes it easier to slide around. Check out https://www.chowhound.com/post/glasstop-stove-cookware-slides-1023133 for some ideas on how to fix it. Personally, I don’t think hitting the bottom with a mallet is something that I can do effectively. It might actually damage your cookware to the point where it needs to be replaced.